Something inside me shudders at the sight of a caged bird. 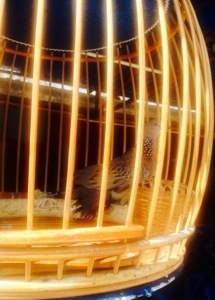 No birds belong in cages, no matter how much a man coveted their grace, no matter how golden the bars. They are far more beautiful soaring free. Heartbreakingly beautiful. “I shall cage it again” said the man with a icy heart. “I am willing to take a chance for the both of us” I said as she flapped her wings, dusted the sorrow and never looked back. If only he could see the beauty of that empty cage!